How much power does a cell phone charger actually use? I've heard that in order to calculate this, you need to pay attention to the input. I charge my phone for 4 hours a day at most. In that case, I use 144 watt-hours a day, and 51840 Wh a year, or 51.84 kWh. And that seems awfully lot, considering that all the articles I've read about the power consumption of chargers stated that they used about 2 kWh a year. I know I charge my phone too much (I really need a new battery), but it still doesn't add up. Are my calculations wrong? And if they are, what is the correct number? The input numbers are a maximum or worst case scenario that the manufacturer wants you to take into consideration, they do not reflect the power draw at 100% of the time. It could be for example, some surge current when first plugging it in due to capacitors charging up, or just some huge margin. Also, the average input current at 100V would be more than double that of when plugged at 240V. 5V and 0.7A gives 3.5W output. If you assume 50% efficiency, that's 7W on the input. Added to that, your phone does not draw 0.7A at 5V all the time that its charging, so in practice, the power draw is a lot lower. 2 - Lets say you fully charge your phone every day. 3 - Lets assume the charger circuitry in your phone has 80% efficiency and the USB PSU 60%. So charging your phone wastes 50% of the energy. That's 16Wh per day. ~6kWh per year. This does not take into account the power draw of the charger when your phone is not plugged in, but on the other hand I assumed pretty bad numbers for the rest of the points. 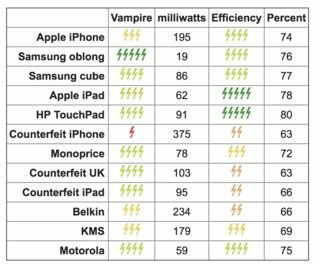 This article from 2013 by Forbes uses 5.45Wh as the battery energy, does not take power losses into account and arrives at a result of 2kWh. You can see in the graph below that maximum current draw falls drastically after the first hour(s) of charge. So even the numbers of 0.07A and 0.03A are the maximum for a brief time. The input rating on mains-connected devices is not there to assess power costs, but to dimension wiring (both house wiring and accessories such as power strips, plug-in timers, and extension cords). In your case, please refrain from connecting more than one hundred such chargers that are specified at a 0.15A input current to an (otherwise unloaded) circuit that is fused at 15 Ampere. The manufacturer is expected, by electrical codes of various countries, to put such a rating on any device - the only thing it is supposed to guarantee is that the device, when intact, will not exceed that input current (inrush currents likely excepted, but not discontinous use eg from a thermostat-controlled device). Not the answer you're looking for? Browse other questions tagged batteries electricity or ask your own question. How much power does a wrist watch use to function? Can I reinsert a partially discharged 12v battery back into a solar battery bank? Supplying 220V to a cell phone battery? 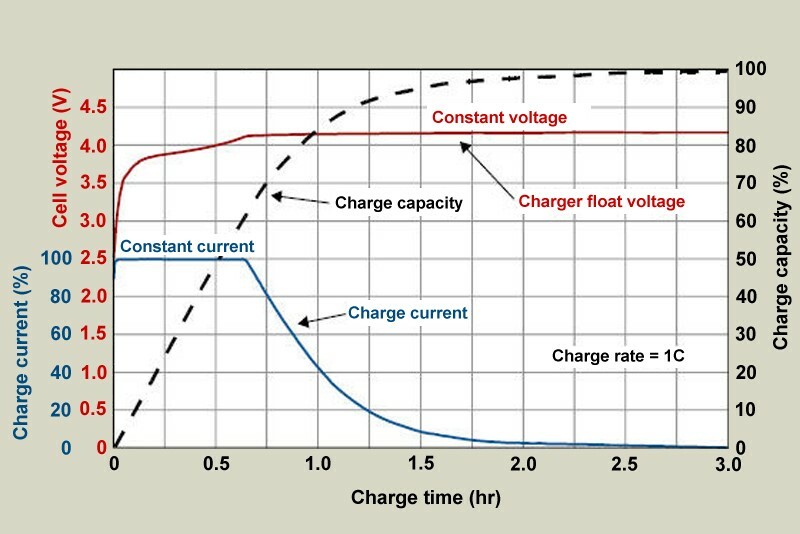 How can the charging time of a cell phone battery be calculated?